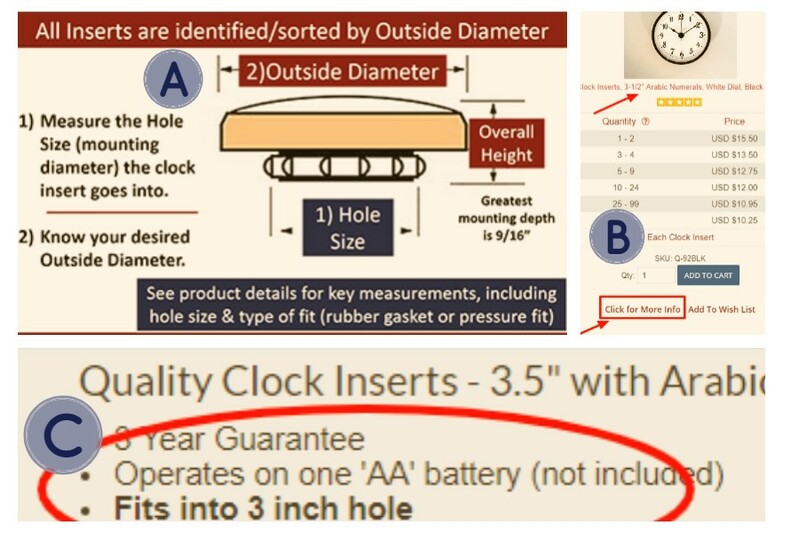 (A) On our website, a 3-1/2" (90 mm) Clock Insert has a 3-1/2 inch (90 mm) Outside Diameter (#2 in the picture below) and the mounting hole size (#1 in picture to the left) it goes into can vary by size, but will be less than 3-1/2 inches. 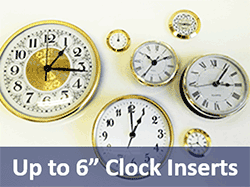 Click here to shop Clock Inserts by Outside Diameter Size. (B) When you find an insert that you like, Click for More Info to see the hole size (C) the insert will fit into. The listing will also tell you the type of mounting the insert uses. Some have a rubber gasket, others have tab style pressure fit. 1) Do you have other sizes of clock inserts? Answer - No we don't. 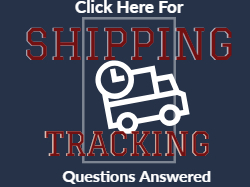 We carry about 150 clock inserts in sizes from 1-7/16" up to 6" outside diameter. 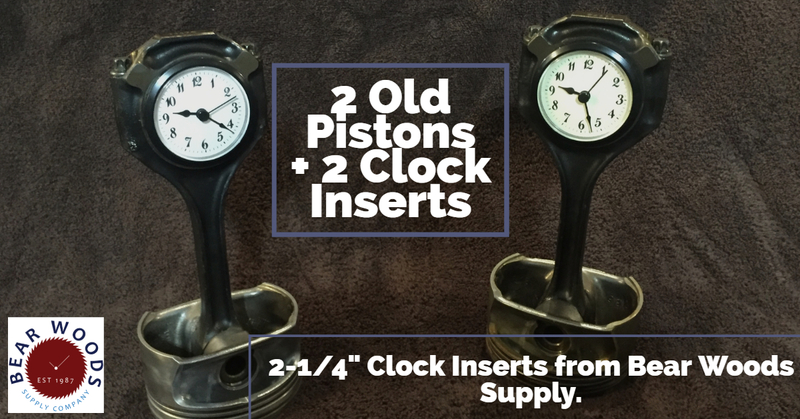 The sizes available are listed on our Clock Inserts Home Page. 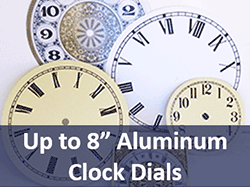 In order to provide prices that are affordable, we have had to focus on the most commonly requested clock sizes. 2) What if the hole size in my current clock is too big? What can I do? Answer - Add some material. Often you can build up the back of your clock insert with something like black electricians tape or some plumbers tape. So if the clock insert says it fits a 3 inch hole size, you can add material so it more snugly fits in a 3-1/4" hole size. 3) What if the hole size is too small? What can I do? Answer - that will depend on the material you are working with. Sometimes our customers will remove a bit of material to increase the hole size to fit. 4) What is the difference with your premium inserts? Answer - Premium Inserts are made with real brass bezels and real glass lenses for a heavier feel a bit better look. We are highly selective with the products we carry and you will see many fantastic reviews on all of our inserts. See our selection of Premium Inserts here. 6) The color or style I want isn't listed on the page for the size I need. Can I get a different one? Answer - Sadly, no. We are limited to the options listed. See the above comments for ideas on how to get one to work for you. 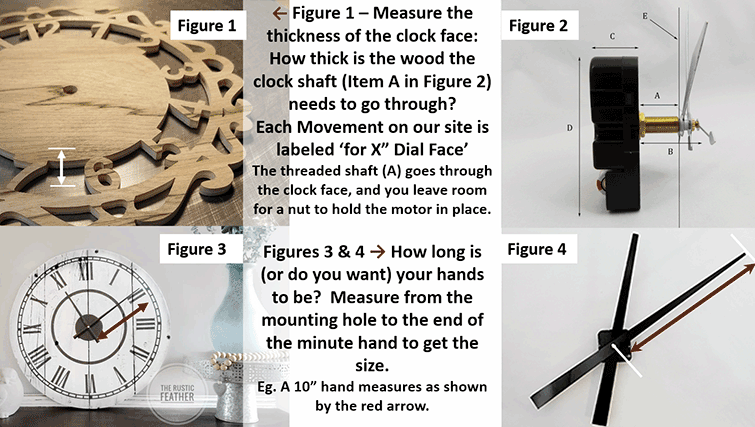 3 Things You Need to Know & Measure - 1) Thickness of your Clock Face/Dial Material. 2) Length of your Clock Hands. 3) Type of Clock Movements. Use this diagram, and the corresponding videos to help with your selections. Can I use my old hands with a new motor or will my old motor fit Bear Woods' clock hands? Old hands may not work with new motors, so we suggest choosing hands and a motor. But we likely have hands that will work great. 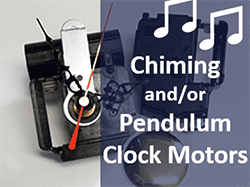 Similarly, old motors may be hard to find the exact one - (we don't have a listing of old manufacturers parts to cross reference), but with our awesome selection you will most likely find a battery-operated quartz motor to make your clock work again. 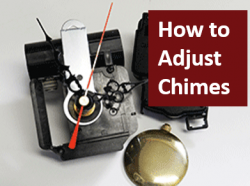 Clock Shaft Length is one of your key measurements. Measure the Thickness of your Clock Face - you just need a measurement of the material the clock shaft has to go through. What is the measurement A in Figure 2 above? Or in Figure 1, how thick is that piece of wood that's ready for a clock motor? Our clock movements are listed by type (scroll down to see categories below) and then by length of the clock shaft - specifically telling you how much material the shaft can go through. For example, our Q-64, the best-selling high torque movement, will go through 5/8" thick material while also allowing for the mounting nut and washer and. Its overall threaded shaft length is 11/16", which allows room for the mounting washer and nut. The overall shaft is then 1-1/8". 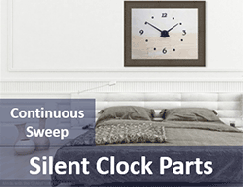 "Click for More Info/Click For Details"
The longest shaft we have is our Q-16 which goes through 3/4" thick clock face material while also allowing for the mounting nut and washer and works with smaller clock hands under 5" long. What size of clock hands do I need? Bear Woods clock hands are measured as in Figure 4 from the the Mounting Hole to the end of the Minute Hand. (In Figure 4 you can see the overall length of the hands pictured is longer) Hour hands are about 2/3 the length of the minute hand. Second hands are sized with the minute hand, and in most cases we sell them separately - see listings for details. 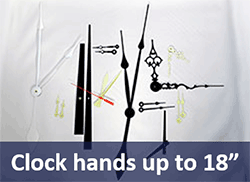 Choose clock hands based on the size of your clock dial you are working with. In Figure 3 this clock is a 24" clock and the designer chose 10" Clock Hands - generally you want your clock hands to sit somewhere between the inside and outside edge of your numbers or numerals. So a little less than half the diameter of your clock face is standard. The length of your clock hands determines whether you need a standard clock motor or high torque (higher power) clock motor. 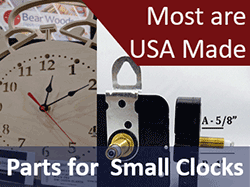 Clock Mechanisms are in 2 Power Categories - Standard for hands up to 4-7/8" and High Torque for hands 5" up to 18". If your Minute Hand Measures Less than 5 Inches Long, Choose Standard Power and we consider this a Smaller Clock. If your Minute Hand Measures 5 Inches or Longer, Choose High Torque (High Power). We consider this a Larger Clock. These types of actions are available in both the High Torque and Standard Power Clock Motors. Most also have options that are run with AA or C-Cell batteries. C-Cells are like having a bigger gas tank. C-Cell powered motors are more expensive but a popular option. Mounting Hardware Included - See details here. Note: All movements except High Torque come with free hanging brackets. 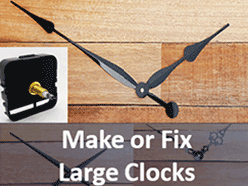 For many designs our Picture Hanging Hardware (click here for details) will be a great option for hanging your clocks. Mounting hardware always includes a mounting nut, mounting washer and a hanging bracket if specified, plus a nut or cap to hold your hands on - read on please for specifics. High Torque Movements include an End Cap in a brass color. You can purchase a black end cap separately. You can also purchase an open end nut separately. Standard (AKA Mini) movements include a hanging bracket, mounting nut, washer, and an open second hand nut. You can purchase a black or brass end cap separately if you are not going to use a second hand. 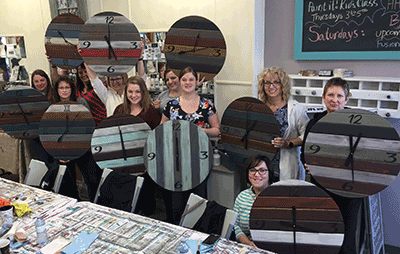 Our free hands typically include a set with hour and minute and second hands, but read product info for details please. Second hands are sold separately with premium hands. How do I find the Clock Hands that work with my chosen clock motor? Start with the Motor - See Types Below. When you have chosen a motor, scroll down to see the hands that go with that motor. Only hands that fit that motor will be shown as you scroll down, from largest hands to smallest suitable. 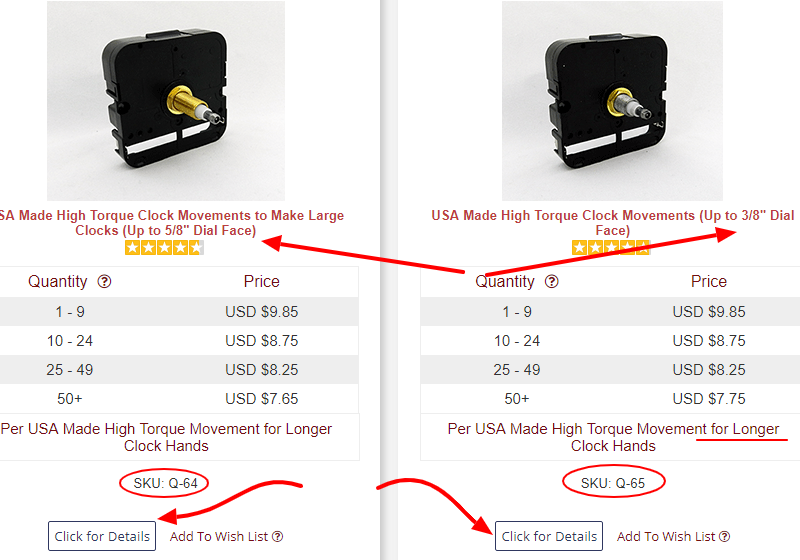 If you prefer - click on the link below to start with your hands selection first (use the guide in Figures 3 and 4) and then "click for details" and scroll down to see the motors that work with those hands. Shopping Tips - Shop below by Standard or High Torque, or Go Direct to Pendulum/Chime Movements, or to Continuous Sweep Movements using the links below. 1) by Length of Clock Shaft - Item A in Figure 2 above, 2) by Battery Type and 3) By Silent or Step Motion, and 4) by High Torque for hands over 5" or Standard Quartz Motors for hands under 5 inches. 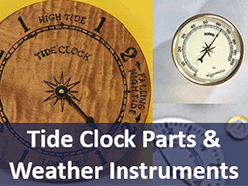 If you have your measurements based on the figures above, you can navigate using the links below to shop for the perfect clock motor. If you don't have measurements, please scroll up to see the helpful and quick steps. Enjoy Quiet Time for Years to Come! 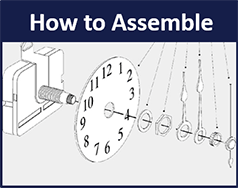 » Troubleshooting tips for clock parts. Excellent Quality, Easy to Use, Great Sounding! We have great options to serve you!